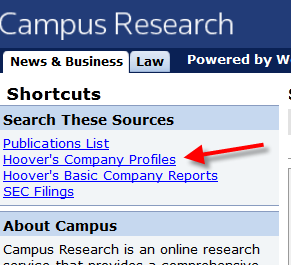 The Campus Research link is easier: the Hoovers link is simply located in the upper left screen. Voila! The Lexis Nexis Way is more complicated. Go to Companies, select Company Dossier and search your company. The information will be from Hoovers. This entry was posted in Business, Databases and tagged Business, Hoovers by Charles Allan. Bookmark the permalink.